The Irish Doodle is a hybrid dog and it is a cross between an Irish Setter and the Poodle (standard poodle). The Irish Doodle usually inherits the light-hearted, friendly nature of the Irish Setter and the non-shedding coat of the Poodle. 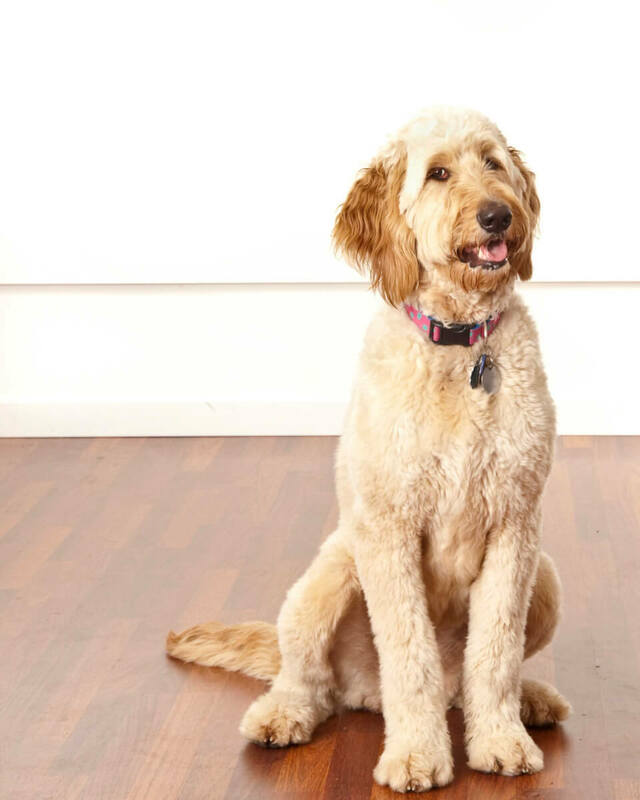 Characterized by loyalty and devotion, Irish Doodles make for excellent family dogs and are ideal for apartment life. Below are the details and specs on the Irish Doodle dog breed. Irish Doodles are medium to large-sized dogs, with a height that can reach up to 24 inches, and weight ranging between 30 and 70 pounds. Irish Doodles are moderately active dogs, only requiring regular walks and exercise. Irish Doodles are very receptive to training techniques and once trained, can get along great with kids, families, and other pets. They can make for excellent watchdogs, with native intelligence and a strong devotion to its owner. Irish Doodles are low-maintenance dogs. Rarely do they shed, and only regular brushing is needed to keep their fur untangled and healthy. They are naturally easy to clean and easy to house train, and are naturally healthy dogs. The Irish Setter first came into popular notice in the 18th century. In the beginning, Irish Setters did not look as red as we know the breed today. The solid red coloring came about by selective breeding practices. It was noted as early as 1845 that Setters in Ireland were predominantly red. The Poodle is believed to have originated in Germany, where it was known as the Pudelhund. It was then standardized in France, where it was commonly used as a water retriever. "Poodle" comes from a German word meaning "to splash in the water." Irish Doodles have a tidy look, with a long coat, elongated face, and a darkened muzzle. Their ears hang very close to their round-shaped eyes. Studies of hybrid mixes and their coats revealed that when the poodle is bred with any soft-coated, long-haired breed (such as an Irish Setter), the result is a shaggy, wavy coat. Irish Doodles have a fur of five basic colors: black, black and tan, brown, red, and white. The colors are dependent on those its parents, the Irish Setter and Poodle. Irish Doodles are medium to large-sized dogs. Their height can reach up to 24 inches, and their weight ranges between 30 and 70 pounds. Irish Doodles vary, most often, in terms of size and coat texture. It is best to consult a breeder if you want your Doodle to have a certain "look". They can tell you the basic differences in these qualities that each generation brings. Remember, F1 is the result of crossing a purebred Poodle (size varies) with a Purebred Irish Setter. An F2 sees two F1 Irish Doodles being bred together. F1B's and F2B's result from that generation of Irish Doodle being "back-crossed" with one of the original parent breeds (Poodle or Irish Setter) depending upon which traits the breeder wishes to strengthen. Poodle x Irish Setter mixes will have a shaggy, wavy coat, however, depending upon the proportions of coat genes inherited, some will be curlier than others.Size is also a consideration when looking for you new pet. Poodles come in Standard, Miniature and Toy sizes, however, it is almost always the Standard ones that are used in breeding this type of hybrid. Those seeking a "Mini Irish Doodle" should search for breeders using Medium and Mini sized parents, but be warned, down sizing often comes with extra health problems. Irish Doodles are good-looking, decent, pleasant dogs with excellent intelligence. They are often described as dedicated, amiable, and self-assured dogs. Irish Doodles like to please the pack leader/family. Because the Poodle was often used as a circus dog, Irish Doodles may inherit this quality and may be amusing and clown-like with its funny instincts. They are naturally easy to clean and easy to house train. Because Irish Setters tend to be high-energy dogs, Irish Doodle puppies are likely to need a lot of attention and exercise until they're older. Irish Doodles that take more of their Poodle parent traits may not need as much. Training is unpredictable, and a lot of patience and perseverance is needed when training this type of breed. Well-socialized Irish Doodles are good with children. They are a suitable breed for kids and are known to be playful, energetic, and affectionate around them. Playtime with children should always be supervised. A well-socialized Irish Doodle is agreeable with other pets. It is important to socialize them with other breeds while at a young age to help improve its interactions with other breeds. Irish Doodles may be aggressive with strangers if not socialized properly. Irish Doodles should be trained socially at a very young age (while still a puppy) to grow more comfortable with other pets and people. Below are pictures of the Irish Doodle dog breed. The Irish Doodle is a moderate maintenance dog. Because it rarely sheds, Irish Doodles are perfect for owners with fur allergies. Irish Doodles need frequent brushing care to keep their fur in good shape. Though not very active, Irish Doodles still require regular exercise and good diet. 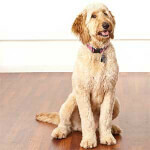 Irish Doodles have a wavy or shaggy coat that is easy to groom. Brushing at least once a week is encouraged. A dry shampoo bath should also be done occasionally. Like Irish Setters, Irish Doodles are less of shedders and are fairly easy to groom. A daily long walk is necessary for the Irish Doodles' physical and mental health. Long walks, running, and jogging should be done every day. When Irish Doodles do not have enough exercise, they may fall prey to obesity. Irish Doodles live well in apartments as long as they are given a good series of sufficient exercises. They are moderate indoor active and live best with an average-sized yard. Because of their thick coat, Irish Doodles can adapt well to a variety of temperatures. Irish Doodles have an average lifespan of 10 to 14 years. Normally they are hardy and healthy, but owners should watch out for general health problems like hip dysplasia, deafness and blindness. Below are common health issues common in the Irish Doodle breed.